Guys and gals looking to make dazzling fashion statements can up their style ante with Yishion’s new edgy collection. Offering affordable and quality pieces to the fashion-conscious set, the international apparel brand showcases clothing tailored for today’s trendsetters. Bold fashionistas can pull off a chic, rebellious look with Yishion’s latest picks that reflect a unique, urban aesthetic. Ideal for mixing and matching, Yishion’s statement-making accessories and eclectic ensembles in deep hues and muted colors can elevate everyday ensembles. The collection runs the gamut from rockstar-style staples like graphic tees and leather jackets to clothing with a touch of goth such as semi-sheer tops and skirts. Other items to check out are on-trend leather bags, quirky accessories such as colorful metal plated belts and metal framed sunglasses. Step out of your comfort zone and bring out your adventurous sense of style with these unique, funky, and fierce finds from Yishion today! 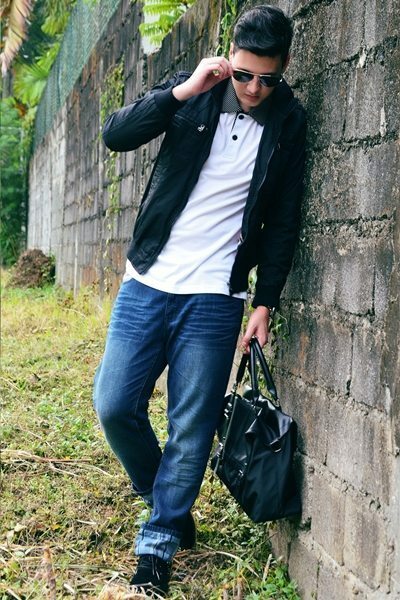 Toughen up a casual combo of jeans and a polo shirt with a black leather jacket and a matching carry-all from Yishion. Yishion lets fashion-conscious guys amp up the cool factor with their dip-dyed plaid shirt and an eye-catching graphic tee. Update a rugged denim shirt and tan pants ensemble with a graphic black and white hoodie. Bring edgy sophistication to work with an intense palette of black and white with hunter green. Embrace alterna-chic style by pairing Yishion’s semi-sheer black pleated skirt with a bow-print lightweight top. Yishion branches are located in Shangri-la Mall, Mandaluyong City and District Imus in Cavite.